She’s having a giant sale this weekend in her Brooklyn studio if you can make it. If not check her etsy shop. I have always been dancing, singing, drawing, crafting…etc since I was very young. My brother, who’s eleven years older than me, was a super talented sketcher/illustrator/graffiti artist back in the early days of bombing. I would gawk over his sketch books whenever I could. Unfortunately he was doing graffiti when it wasn’t considered an art form and I was so young that I think I began to equate art with trouble. My family was always insanely supportive of anything I did but something inside me held back until I took my first formal art class while in college over at Northeastern University in Boston. I found myself pulling all nighters working on sculptures and just transferred over to Parsons in NY. The rest is well…history in the making. Was it hard to start your own business? Yes and no. When you don’t have anything to start out with then what do you have to loose? It was and is challenging but this crazy ambition and constant support from family, friends and now fans/customers helps fuel my will a whole bunch. Did you have to work two jobs till it got rolling? More than two, doll. More than two. I’ve done a lot of freelance and even held down a full time gig designing handbags all while building the business. I also taught industrial design to second year design students in Japan. I’m not opposed to multi tasking at all. I think it’s healthy to take on other projects and challenges if you can. Any advice to other artists who might want to take their work to the next level? Be realistic about your money game! Quit spending money needlessly! Be organized. Have an idea of the work you would like to develop in the next few months to a year. Work on self promotion. Send press kits. Don’t spend a bunch of money on that either. Your home printer and emails work wonders. Try not to loose heart and refrain from putting all your eggs in one basket. Have another career in mind that can possibly support your artistic habit. 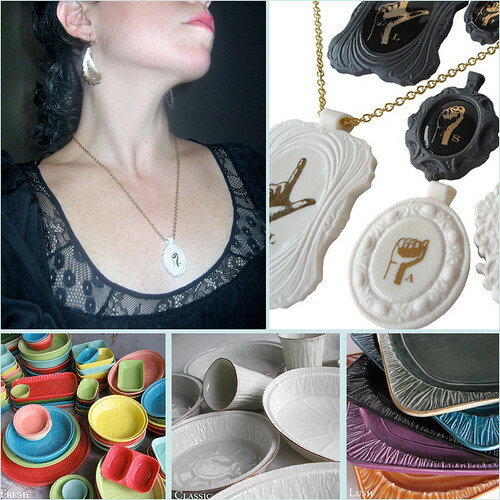 What made you venture from ceramic plates and bowls into jewelry? What initially inspired me to create jewelry was my father who worked in the diamond district in NY for about 35 years. He’s made a lot of pieces for my family and I throughout the years. I made some jewelry while at Parsons and have finally found the opportunity to introduce it back into my body of work. Briefly tell us what a day in the life of Lorena would be like. Wake up. Have some coffee while reading my bible. Pray a bit. Head to the computer read over emails and get to the studio. Work, work, work, work. Have lunch while working on the computer. Work, work, Work. (Build in gym time here…I’m working on that…promise!) and head home to have some dinner and watch Top Chef! What’s your favorite thing to do besides art? Everything. I try to keep my brain open to everything and anything. Textures, colors, patterns, people, music, family, love, fashion…. What other artistic ventures do you have planned? I don’t know…you’ll have to stay tuned!Â Oh wait! I’m in the middle of planning my wedding! Does that count? Do you draw your ideas out or are you a tactile 2D-3D hands on gal? I write a lot, do some initial sketches, and then head straight to model making. Thanks for stopping by Lorena. her work is amazing! i’m constantly eying it on etsy. 🙂 what a great interview!! Thanks Jess. I have truly been admiring her work since I first laid eyes on it. I love my necklace but really really want to get my hands on the gourmet collection while it’s on sale!! EEK. I’m trying to be retail chaste….you know printing for the trade show is gonna cost a lot….but I really covet her work. It was a lovely interview. She’s so interesting to me. Thanks yasmine. I seriously love her work. I’m excited for the show too…but very nervous that no one will come. Plus I have a ton of work to do and such little time. Where does the time go? Jessica Gonacha is in the show too so that will be fun. I hope we both do ok!?! This was such a fun interview! I have been in in love with her pottery for so long and hope to someday have tons of the white–hint hint hint (anyone?) for a big dinner party. Great post! yes, the white with god trim is my favorite too! I adore it! She just had a sale so check her etsy shop. I could not make the sale so I’m checking her shop now too….